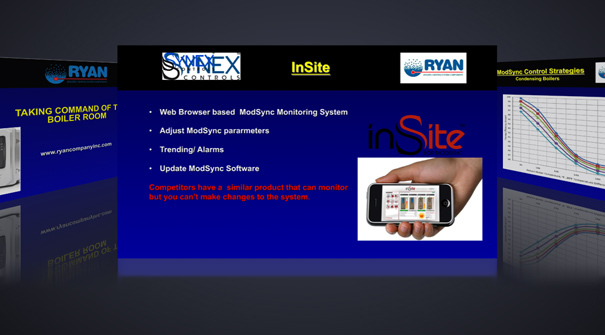 Lunch & Learn - Ryan Company Inc.
"Take Command of the Boiler Room"
The ModSync® is a fully customizable, boiler control system. It can be used to control the entire system—not simply the boiler. Our presentation will talk about the logic behind the product as well as benefits compared to competition. We will discuss boiler piping system layouts and design and how to incorporate the ModSync into your controls and design. We will cover condensing boiler efficiency and the logic behind it as well how that logic is used in the ModSync programming. We will also talk about what Ryan Company can do for you and a brief summary about Ryan Company. Ryan Company brings "Lunch & Learn" presentations to engineers, firms, end users, technical societies, or anyone wanting to learn more about products we offer, and keep up with the latest technology, etc. To check the schedule, go to our Events Calendar to find upcoming Lunch & Learns, and sign up to pick your date and time. Also you can view and download old presentations. Contact Mathew Kiemen with questions or inquiries. Note: normally people sign up between 2 and 4 weeks before a class is scheduled to begin.